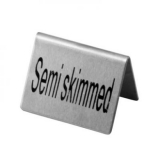 This stainless steel milk table signs are an attractive way to Inform and organise your busy cafe, bar, pub or restaurant. Being made from stainless steel they are strong and easy to clean and are double sided so can be seen from multiple angles. Durable & rigid tent-style design. Bold font for easy identification. Colour silver with black text.